Angry Birds! I think it goes without saying, but I think we all know how addicting this game is. Their popularity has certainly sky rocketed, and you seem to see them everywhere. Finnair even held an Angry Birds competition on their inaugural flight from Helsinki to Singapore! I don't know about you, but that's pretty extreme if I say so myself. 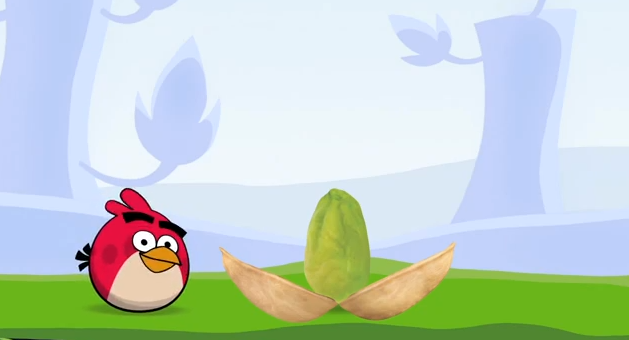 Anyhow, here is the latest "Get Crackin" commercial from Wonderful Pistachios. Definitely a little biased but I loved seeing this commercial. It certainly beat seeing Snooki in their last spot. What I find amazing about this though, is that, this company is able to generate so much interest about something so simple like pistachios. Whoever thought pistachios could even be cool? Well, this commercial certainly gave me that feeling.